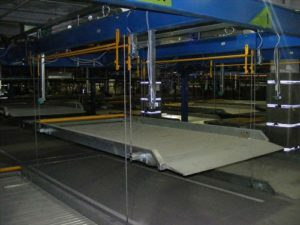 Parking Lift Systems: Automatic Systems, Inc. was approached to find a unique situation for a parking garage. 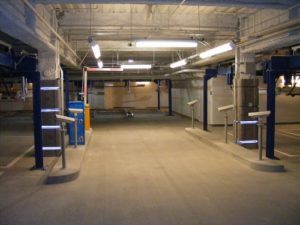 Due to lack of parking space inside a zero lot line property, ASI designed, installed, and commissioned 424) Automotive Parking Lifts inside The Cosmopolitan Hotel and Resort underground parking garage. Each lift unit allows one parking space to accommodate 2 vehicles thereby creating 848 parking spaces. After a vehicle is parked on the lift platform, a trained operator controls the lift using a local touch screen HMI/PLC (Human Machine Interface/ Programmable Logic Controller) panel. Each HMI/PLC panel distributes building power to a group of 4 to 13 lifts, monitors the lift sensors for proper operation, and allows only a maximum of 3 lifts to operate simultaneously. An electric gearmotor, coupled via a roller chain, turns a drive shaft fitted on both ends with dual wind wire rope drums. Four wire rope cables (2 per drum), guided by pulleys, raise and lower each lift platform as the cables wind and unwind from the wire rope drums. 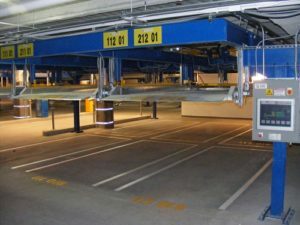 When a lift is in the raised position, a second vehicle can be parked underneath the vehicle on the raised lift platform. Due to size limitations with larger model cars, we worked with a valet service to measure the vehicles and assign parking locations as appropriate. Each vehicle enters a station for measurements and photographs. It is a unique solution for a common problem, as building and parking spaces rise in cost. Automatic Systems, Inc. mechanical and electrical capabilities combined to provide a turnkey solution for a valued customer. Operations, facilities, IT, structural, and architectural disciplines were all involved to make the choice Automatic.